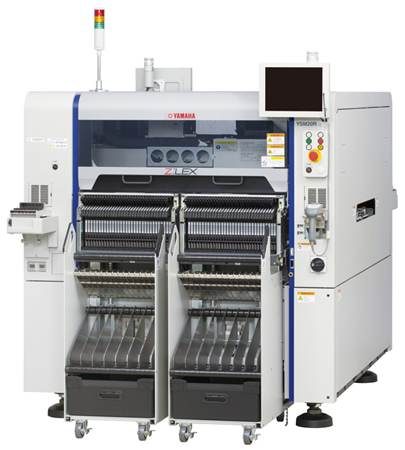 Announcing High-end High-efficiency Modular Z:LEX YSM20R, All-around surface mounter with enhanced “1-head solution” and achieving the world’s fastest mounting speed in its class - News Releases | Yamaha Motor Co., Ltd. The YSM20, a leading Z:LEX Series model, offers high productivity, adaptability to various components and superior production changeover ability based on its “1-head solution” concept to accommodate a wide range of component sizes—from super small chips to large components—with a single type of head. The new YSM20R is a high-end, high-efficiency modular mounter that enhances the production capabilities of the YSM20 and joins the series lineup as a deluxe model aimed at boosting competitiveness. With the YSM20R, Yamaha focused on increasing XY-axis speeds and revising the actions involved for pick-up to placement, and successfully improved mounting speed by approximately 5% compared to the YSM20. Also, by improving the performance of the wide-scan camera on the head, the YSM20R can mount components up to 12×12 mm in size (up from 8×8 mm) at high speed, thus improving productivity. Further, the new Auto Loading Feeder (ALF) using proprietary Yamaha Motor technology, the “sATS30NS” Auto Tray Sequencer (ATS) for nonstop tray replacement and nonstop feeder carriage exchange system (all available as options) reduce costs and time loss while further improving machine operation rate. The Z:LEX YSM20R will be on display at the 47th Internepcon Japan electronics manufacturing and mounting technology exhibition to be held at the Tokyo Big Sight (Koto-ku, Tokyo) from January 17 to 19, 2018. *1: Surface mounter: Manufacturing machine for mounting various electric/electronic components on the printed circuit boards (PCBs) used in electrical appliances and electronic devices. *2: CPH (Chips Per Hour): Total number of chips that can be mounted per hour (unit time). Indicates processing capacity under various conditions. *3: Components mounting speed (CPH) for a surface mounter with the 2-beam, 2-head layout under optimum conditions. Based on Yamaha Motor data as of January 2018. In recent years, various products including household appliances, personal computers and mobile phones have become more compact, denser and gained greater functionality and diversity. Moreover, their lifecycles have become increasingly shorter. Consequently, the mounting process for the electronic components in these products has seen calls for higher speeds, but also the flexibility to efficiently accommodate wide variations in component types and quantity as well as handle mass production on the same production line. At the same time, in order to achieve both productivity and compatibility with a wide range of components as sizes have become extremely small and parts more diverse, manufacturers typically selected and swapped different mounting heads to suit the characteristics of the mounted components and production volume. However, head replacement has caused a number of major issues including production downtime during replacement and investment loss from the need to purchase and store spare replacement heads. In addition, if there was even one large component that needed to be mounted on a PCB, the manufacturer could not use high-speed mounting for small components and would have to replace the head with a low-speed multi-head. This resulted in critical disadvantages such as losses in efficiency due to reduced throughput and/or bottlenecking. To address this issue, Yamaha Motor has worked to optimize its “1-head solution,” to handle a wide range of component sizes from super small chips to large components with a single type of head. Employed on the Z:LEX YMS20 all-round high-efficiency modular mounter released in July 2014, this model eliminates the downtime for head replacement and efficiently and flexibly accommodates various production formats while boasting the world’s fastest mounting speed in its class. Since then, the pace of sales of this mounter have accelerated. To respond to the market’s need for even higher levels of performance, Yamaha Motor has developed the Z:LEX YSM20R as a high-end model of the Z:LEX Series, featuring even higher mounting speed, efficiency and functionality. Tapping into our strength as a comprehensive manufacturer offering a full lineup of surface mounters, printers, dispensers, inspection systems and more, Yamaha Motor will continue to make its mounting equipment operate seamlessly and thus further improve overall line production efficiency and quality. Yamaha Motor increased XY-axis speeds, improved the actions involved in pick-up to placement, reviewed and revised the rigidity of structural parts to withstand higher mounting speeds and more. As a result, the YSM20R boasts the world’s fastest mounting speed in its class of 95,000 CPH (under optimal conditions as specified by Yamaha Motor), an approximately 5% improvement compared to the YSM20. “Flying recognition,” a function for recognizing components in the shortest path between pick-up to placement positions, enhances the performance of Yamaha Motor’s proprietary scanning camera to enable high-speed mounting with zero recognition time loss. In addition to accommodating components up to 12×12 mm in size for high-speed mounting (up from 8×8 mm), side lighting is used to allow for high-speed recognition of Chip Scale Packages (CSP) and ball electrodes like those in Ball Grid Arrays (BGA), vastly improving real production capacity. The YSM20R also handles super-small 0201 size (0.25 × 0.125 mm) components. Yamaha Motor has developed a new ALF that allows any operator to easily supply tape components by merely inserting the tape, all without stopping the machine. Yamaha’s unique center-open system, which eliminates the need to remove the top tape, reduces pick-up errors due to static electricity from fuzz or peeling. In addition, a Yamaha-exclusive tape setting mechanism that extends towards the operator to simplify tape setting and a mechanism that allows for two reels to be set at once on the feeder greatly improves ease of use for the operator. The ALF also offers a splicing-less* feature that significantly boosts operating rate by reducing machine downtime and work time, reducing the running cost for splicing work and making the recovery of top tape unnecessary. This ALF will be available on all current YS Series mounters (limited to those with the tape cutter specification) as an option. *Eliminates the need to splice new tape to the existing tape being used when feeding components into the tape feeder, the device feeding electrical components. The “sATS30” 30-step fixed automatic tray supply unit has gained a new feature that removes empty trays and supplies new trays without interruption of automatic operation. Simply replace the empty trays, which are automatically ejected, with new trays and press the feed button to automatically set the new trays in the magazine. In addition, the entire magazine can be replaced during production changeovers. Previously, the machine had to be stopped when removing the feeder carriage exchange to ensure safety. Now, Yamaha has installed a sliding shutter cover over the pick-up area of the opening that is created when the carriage is removed. The shutter automatically closes when the carriage is removed, eliminating the need to stop the machine for carriage replacement and thus improving machine operating rate. *Component height of 6.5 mm or higher or component sizes of 12 mm in length/width or greater requires optional multi-camera. Please contact us for info regarding mounting 0201 components. Fixed plate 140 types max. Feeder carriage 128 types max.